As you can see, my love of photography started out very early. 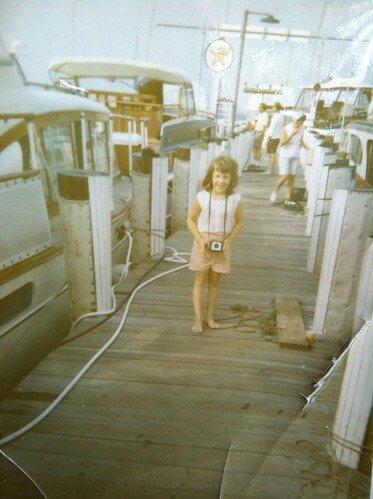 My favorite little Kodak Brownie camera, by the sea down the Cape, in the summer; 3 of my all time favorite things. I don’t think I’ve changed a bit, do you? I’m holding a camera in my photo today, too–I guess it’s just hard-wired in us! It looks like you’re on a dock, but it’s closed in at the end. What’s going on? OH how utterly cute and awesome! NO. You have not changed a bit! I had a 110 camera way back when too! and most of the pictures I took with it. Yes!! more detail on where you are and what’s going on! I had an instamatic. My mom would keep telling me, “don’t waste film” and only let me take one picture per place. I just love life now, being able to take as many photos as I want! You did get a young start! What a great picture. Love it! I’m not sure what I love more, the picture or your port title. Oh yes, I remember the time when photos were limited. Aren’t we lucky girls today?